Freedom (or wild) camping is a term used to encompass any overnight camping (whether in a tent, campervan, car, or motorhome) that does not take place in an official campground or holiday park. In essence, it means pulling up of the side of the road and spending the night just about anywhere. Although a common occurrence in New Zealand, recent changes to the law have led to a great deal of uncertainty about the legality of freedom camping. This confusion has partly been fueled by parties for whom freedom camping is not in their interests, such as commercial campground operators and local councils. To put the record straight, freedom camping is perfectly legal in New Zealand. It can be a wonderful way to explore New Zealand's unique geography and landscapes. However, if you do wish to freedom camp then you should know your rights and responsibilities. In summary, you have the right to enjoy public land provided you act responsibly. A fear that uncontrolled freedom camping would create widespread damage to the environment and social problems due to "every man and his dog" squatting in tents and campervans all over public land. This fear was partly the result of a large influx of tourists (many of them in campervans) for the Rugby World Cup in 2011. These fears have of course never materialized. Political pressure by many owners of campgrounds and holiday parks who feared a loss of business due to campers not being 'forced' to stay at their properties. The result is that in many places around New Zealand you will find signs that have been erected by the local council prohibiting overnight parking or camping. Some councils have even placed "blanket bans" in their entire region or restrictions such as no overnight parking within a certain distance of a campground or urban area. A few councils have tried to appear to be appeasing the campers by banning freedom camping in general, but "allowing" certain small and specific areas to be used for overnight camping. They have even been backing up their position by appointing officers to patrol the region and 'move people on' if they are found to be freedom camping in a non-designated area. In actual fact, all of these actions by local authorities are not lawful under the Freedom Camping Act 2011. The law did allow some time for the councils to bring their by-laws into line with the Act, but this time has now passed. It is necessary to protect the area, to protect the health and safety of people who may visit the area and/or to protect access to the area. Although a council may impose restrictions if they deem it necessary (such as limiting the number of nights a person can stay or limiting it to self-contained vehicles only), they cannot impose a ban on an area unless there is strong evidence to prove that freedom camping itself has created problems with the above and that such a ban is the only way the problem can be resolved. While the confusion exists—and while certain vested interests continue to play on the ignorance of the public to the law—it is very important to know your rights and responsibilities for freedom camping. After all, most people have the same objective as the law: to enjoy this wonderful country as much as possible, while causing as little negative impact to the environment or to other people as possible. When visiting an area, make a point of contacting the local council or Visitor Information Center (these are in most towns) and ask them which areas have been specifically designated as prohibited from overnight stays under the Freedom Camping Act, 2011. Preferably, ask for a map or list. If they cannot provide you with this information (or don't understand what you are talking about which, unfortunately, may be the case) then you can assume that you can freedom camp in virtually any spot in the district. If you are not in a self-contained vehicle (i.e. you do not have toilet and washing facilities with appropriate storage for fresh water and waste), or you are in a tent, stay in campgrounds as often as possible. These are not expensive, usually have excellent amenities and are often in some of the best locations in their area. Backpacker hostels are another good option for overnight accommodation. If you are not in a self-contained vehicle and you do spend a night away from a campground, make sure you park near a public toilet block. These are to be found in a huge number of locations throughout the country; there will almost always be one in the most popular spots, especially beaches and parks. Whatever sort of vehicle you are in, dispose of waste responsibly. Use rubbish bins for general waste and use dump stations for toilet and 'grey' water waste. Be responsible in your choice of location. Don't choose somewhere where you being there is likely to disrupt the environment or cause damage to flora or fauna. And be sure to stay safe. Carefully tidy up when you leave the site; leave nothing behind but your footprints. If you also see litter left by others, do your bit and dispose of it yourself. If you see someone else damaging the environment, littering (or worse) or being a nuisance, report it to the local council. If you are staying in New Zealand for any length of time and will be doing a lot of traveling in a motorhome or caravan, consider joining the New Zealand Motor Caravan Association. This association has a huge range of benefits for members, a vast knowledge base about everything to do with this type of travel and a large pool of friendly members who will help you on your travels. Learn more about the NZMCA on their website on their website. No one likes confrontation with officialdom, especially when it threatens to spoil your holiday! However, they are not there to impinge on your rights, either, and many seem to be operating with false information. Although some were able to in the past, councils are no longer able to issue instant fines for freedom camping, unless for a site specified as no-camping in accordance with the guidelines of the Freedom Camping Act. They also cannot insist you move, unless you are in one of their specially-designated no-camping areas (in which case they should be clearly signposted as such). Ask them if where you are parking is public land. If it is (and it will be if it isn't private land), ask them if it has been designated a specific no-camping site under Section 11 of the Freedom Camping Act 2011 and on what basis. If they appear confused, don't know, won't answer or give you any response other than a direct answer to that question, gently remind them that under Section 11 of the Freedom Camping Act 2011 and the New Zealand Bill of Rights, you are indeed within your rights to be there. If they tell you that you "need a permit," that "it is against council regulations," or is in violation of any other apparent law, remind them that any council bylaws or other regulations that are not in compliance with the Freedom Camping Act are actually unlawful. Councils were given until 30 August 2012 to have them comply. If you are not satisfied with the responses you are getting, refuse to move. Politely suggest to the person concerned that unless you are given concrete information that shows you are in breach of the law, then you are not obliged to move. New Zealand is extremely lucky to have the rights of everyone to enjoy the countryside preserved in law. Both the Bill of Rights and the Freedom Camping Act reinforce the right to free and responsible movement on public land. Know your rights, act responsibly and help preserve this wonderful country for the future. 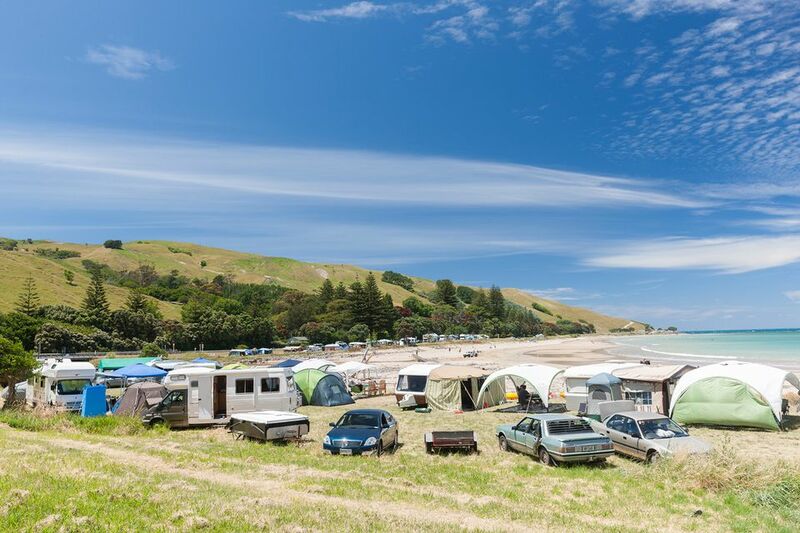 Unfortunately, despite the conflict with the Freedom Camping and the other laws of New Zealand, you will find councils which will enforce a $200 fine if you freedom camp in their area. The worst area for this is Queenstown. Until council bylaws are made to comply it is best to avoid freedom camping in these districts.